"This is a strange name for a cake, but it is very good." Measure flour, sugar, soda, salt, cinnamon, oil, eggs, vanilla into mixing bowl. Beat until smooth. Stir in pineapple with juice, bananas, and pecans. Pour into prepared pan. Bake in oven for about 70 minutes. Turn cake out onto rack or plate after cooling for 20 minutes. 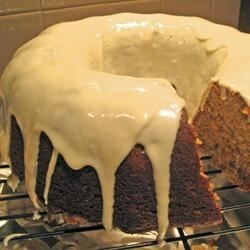 Cool, and ice with cream cheese icing. In a topsy-turvy world, this may be the perfect dessert. I love this recipe, it is quick, easy and taste wonderful also! This is one that you will want to try!